The verification form is a routine step for procuring several services and accomplishing many tasks and activities. Essentially the process of verification is done to determine the authenticity and accuracy of data which has been presented in an application form or a verification form. Depend on the purpose, the format and making of a verification form are different. There are various kinds of verification forms available, thanks to the diversity of tasks and endeavors they get utilized in. 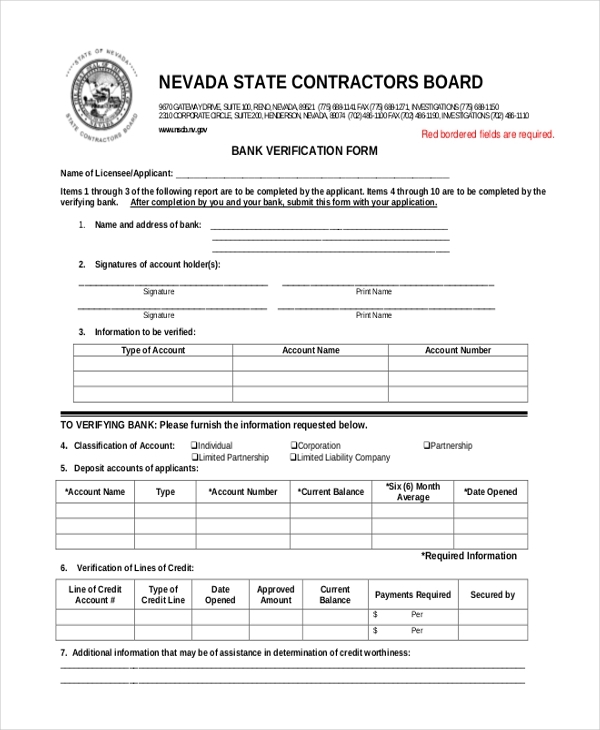 A bank verification form is used by companies and other corporate outlets for authenticating the bank account details of an employee or client who may be joining or participating in a new project or assignment. In order to show proof that an individual has the previous history of community service, they would be required to fill in the details of their community work and the number of hours dedicated to each community service endeavor. A community service verification form is used for this purpose. 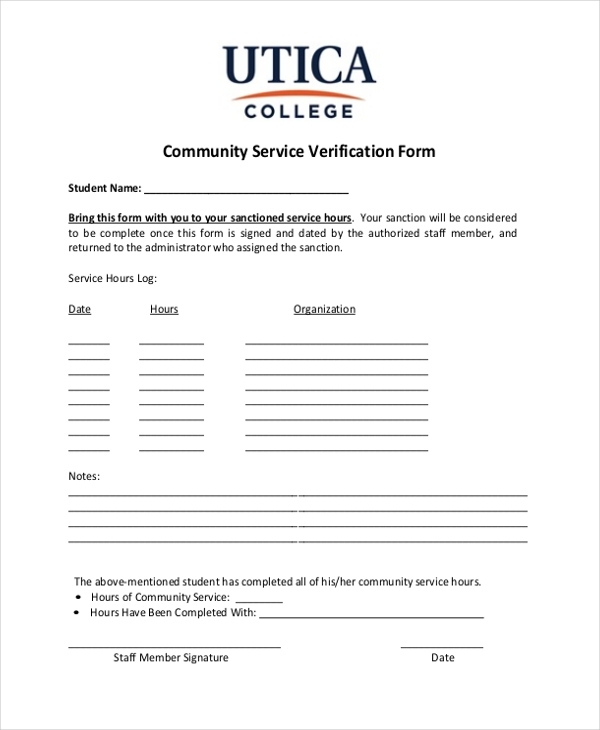 In many schools and universities, when students apply for financial services to support themselves, the concerned authorities hand out a dependent verification form to be filled by the applicant. The information in the form is duly verified to understand and know how the eligibility of the applicant’s financial services request. 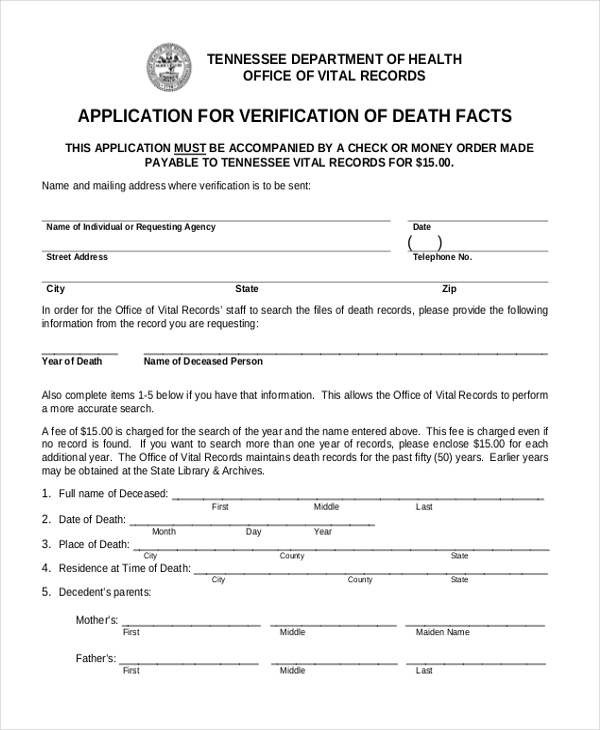 A death verification certificate is used for the purpose to establish and authenticate that the person named in the form is actually deceased. 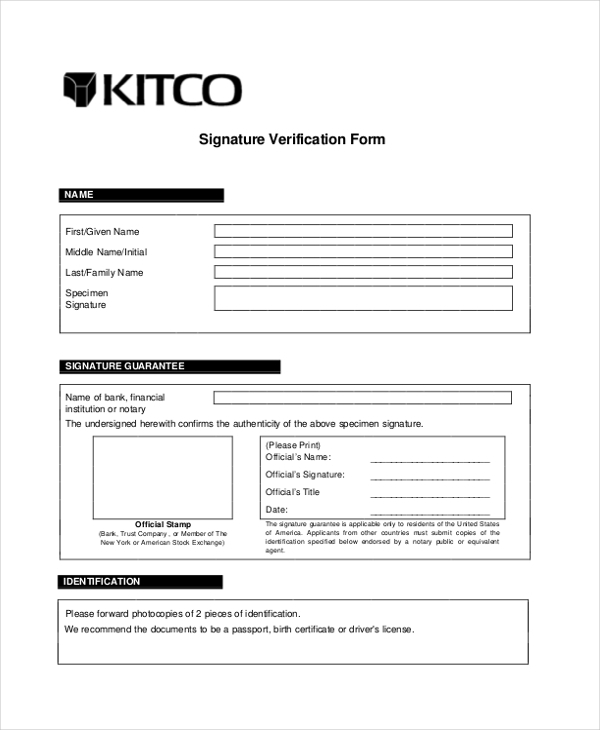 This kind of verification form is used by a number of outlets and agencies in order to meet out different actions or services. 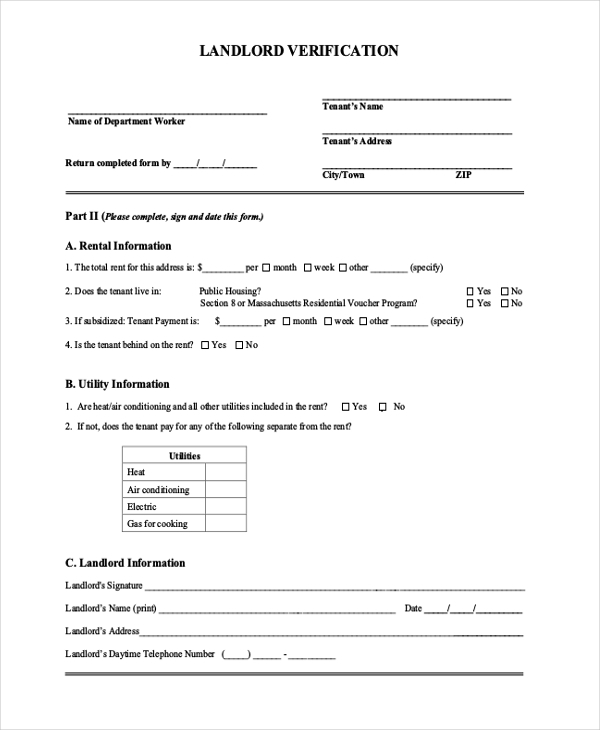 In case a tenant is to be made a participant in a housing program, the authorities would ask the employer of the applicant to furnish details of his employment for verification purposes, this is when an employment verification form comes into play. 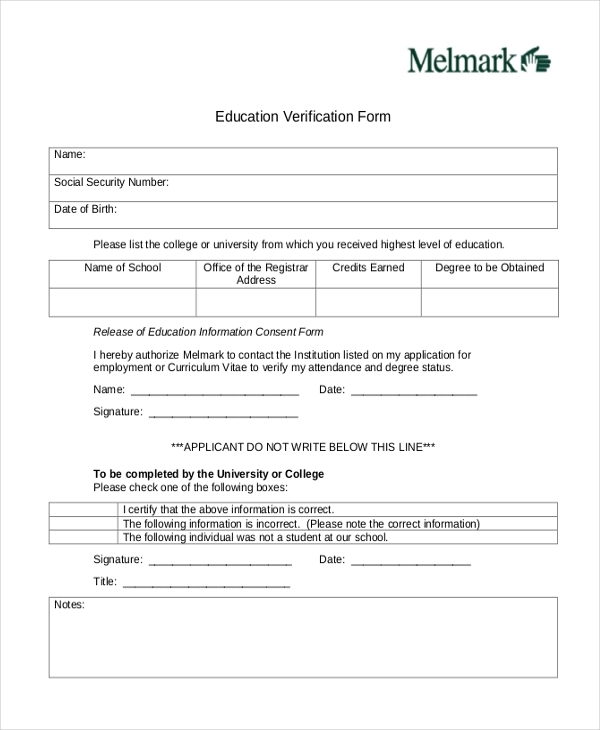 If a person wants to apply for a higher education or employment, companies often request for an education verification form to be filled and filed with the authorities. 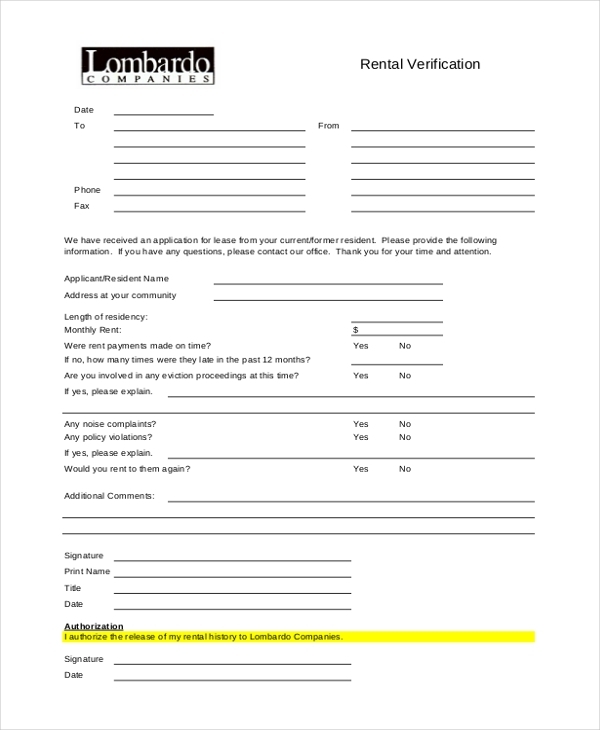 This form basically contains information pertaining to the educational history of the applicant. 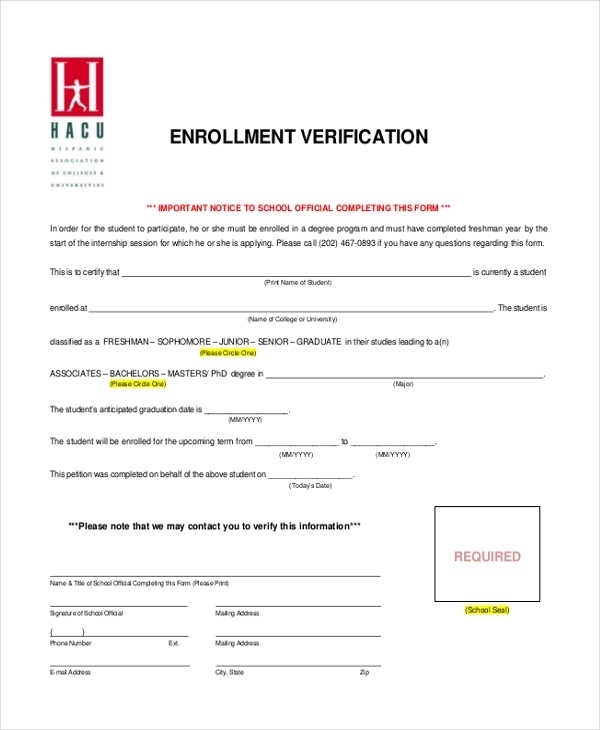 Prior to enrolling in a certain program – professional and academic – applicants are required to populate and submit enrollment verification forms so that the authorities can verify whether or not the applicant meets the enrollment eligibility for the program. 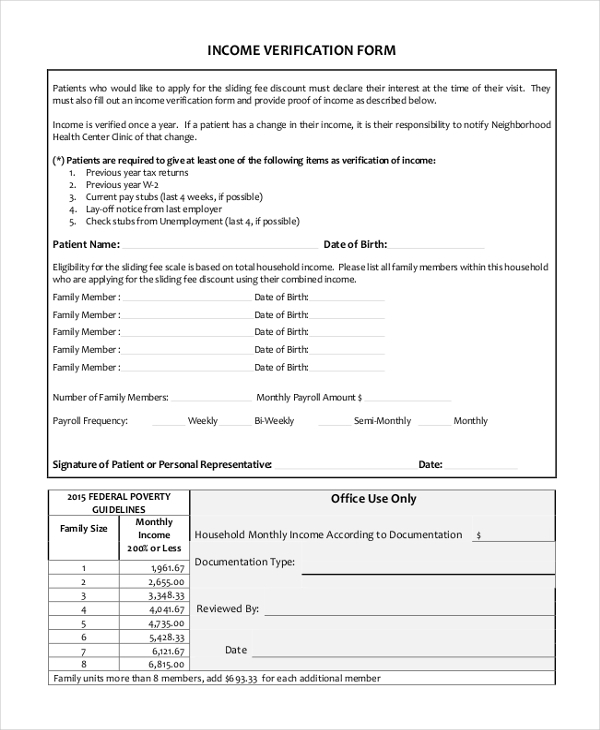 In cases where patients need to avail of medical discounts on grounds of their financial conditions, hospital or clinic authorities seek income verification forms wherein a patient’s economic details are provided in detail. Alternatively, such a form could also be used in cases where patients are participating in special discounted medical programs. Identity verification is a norm procedure for a range of tasks. Be it bank-related, medical, legal or academic, identity verification forms usually contain multiple fields wherein applicants or users must populate them with relevant details so that authorities can be assured of the applicant’s identity. 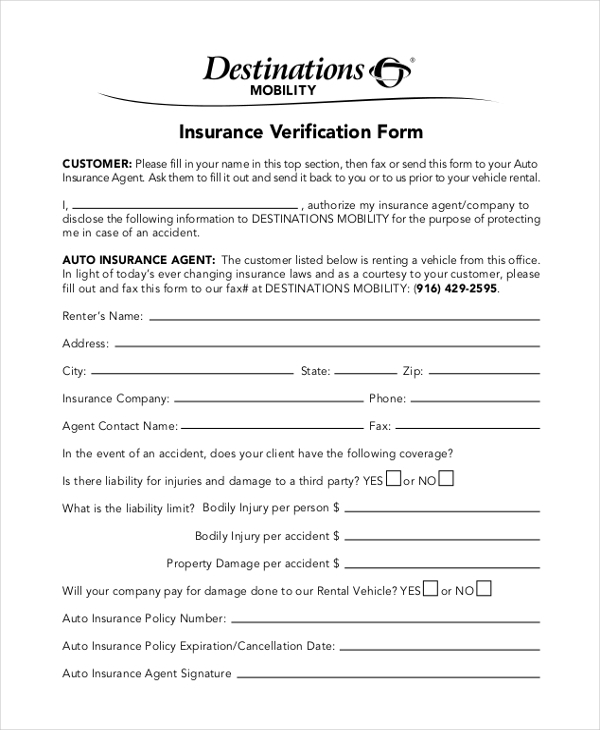 Whether you’re servicing your vehicle or getting repairs in your office or home, if the said property is under insurance, you may be asked to fill and submit an insurance verification form confirming the same. 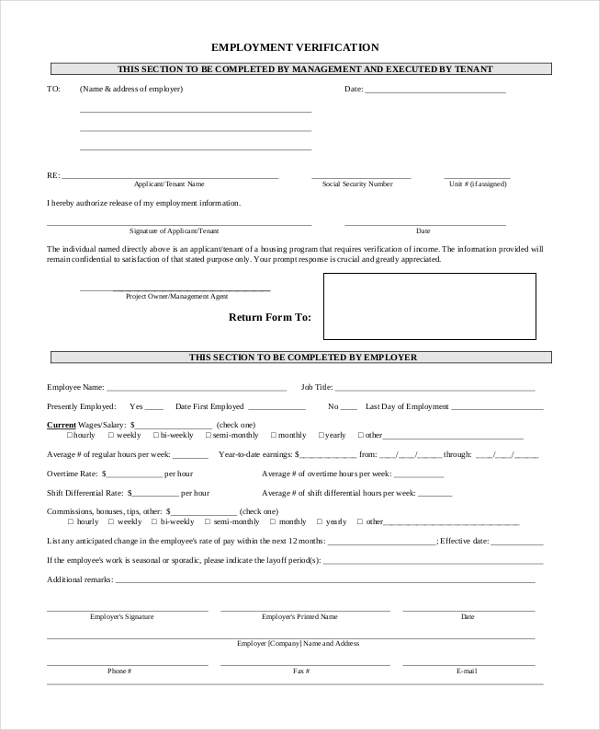 Job verification forms are similar to employment verification forms. The main use and significance are that the user or applicant’s current and previous job details be provided in the form in the most accurate fashion. The main purpose of landlord verification form is to present itself as proof of residency. The form is supposed to give accurate details about where an applicant lives and the range of expenses which he or she incurs for renting that property. Landlord details must be provided as well. If you have applied for financial aid of some kind, a legal verification form must be filled and duly submitted. The forms give a detailed overview of your family and its members as well as details of where you live, insurance and medical information too. 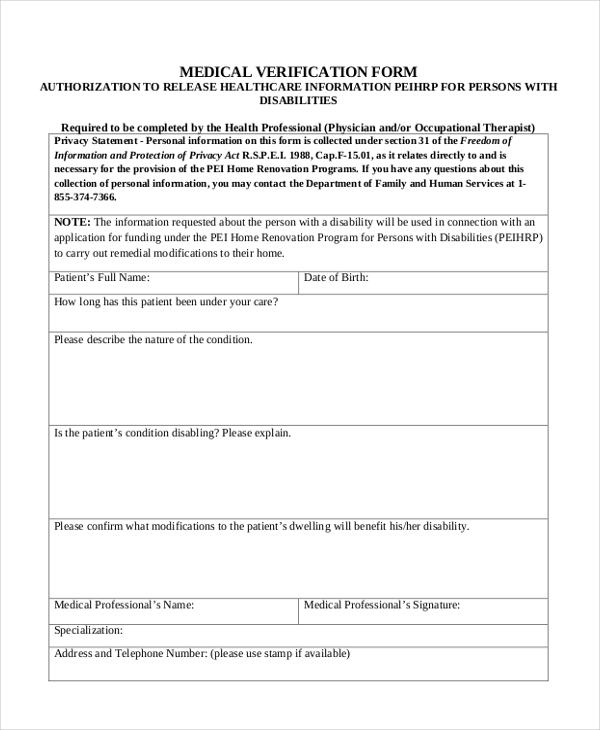 A medical verification form is utilized by authorities in scenarios wherein they have to verify whether or not the applicant is or not a subject with the medical condition specified in the form. All details – including an accurate description of the medical condition and treatment needs to be provided precisely. 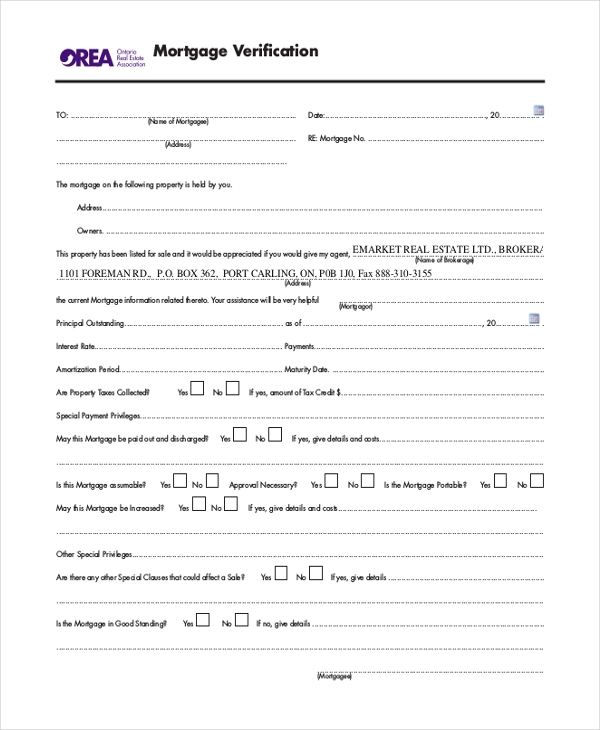 In case a mortgage property or asset is being made to go on sale, the concerned parties are going to need to fill up a mortgage verification form in order for officials to authenticate that the mortgage is or not indeed bound by any terms of conditions which may conflict its sale. In matters concerning to the lease of a particular property, landlords are required to fill and present rental verification form to concerned authorities to furnish details about the tenancy of the current or former resident applicant who has applied for lease. A signature is a tricky form of identification. Although it may be authentic but the signature forgery is also common. In order to steer clear of signature fraud, companies and a lot of authorities seek for the applicant to fill and submit a signature verification form containing multiple impressions of their signature and note of guarantee. A tenant verification form is a document which a tenant is required to populate and present to establish that that the tenancy is valid. Ideally, a tenant verification form contains multiple fields wherein the user is supposed to provide information regarding their background, tenancy history, permanent address, profession, the address of the house rented and rent amount agreed on and last submitted on. For a range of purposes, legal and official, individuals are required to submit a work verification to show their work history and have to do so in a detailed manner so that there are no gaps in the authentication process. 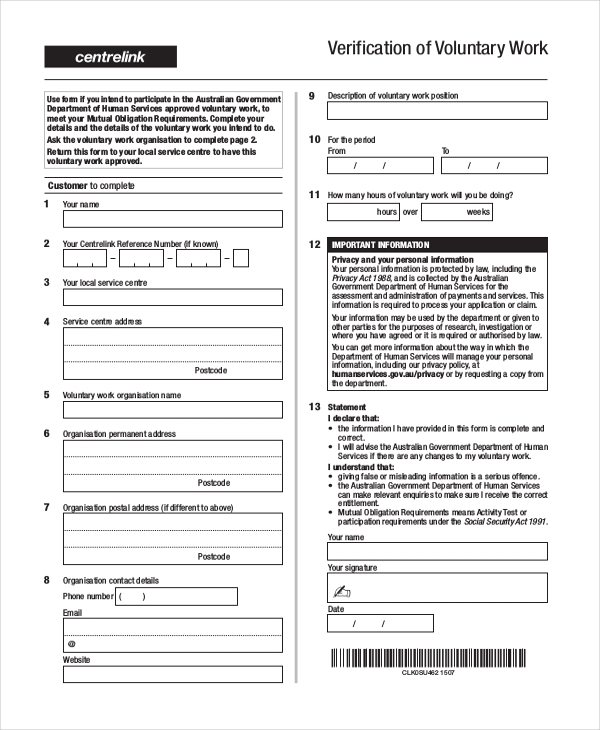 A work verification form is useful in academic, employment, and visa application scenarios. 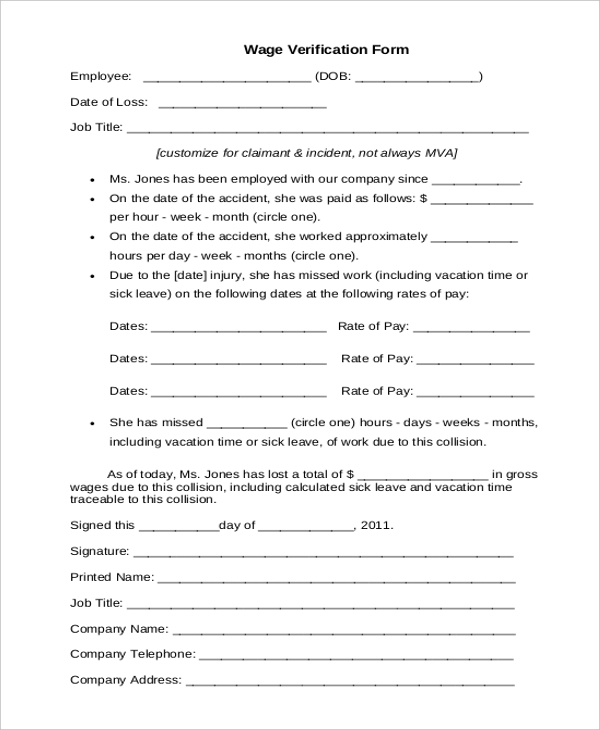 If an employee meets with an untoward incident that results in his absence at work, the employer company needs to fill and file a wage verification form in which indication of loss – date, time and overall amount of wages and work hours lost in the aftermath of the incident. 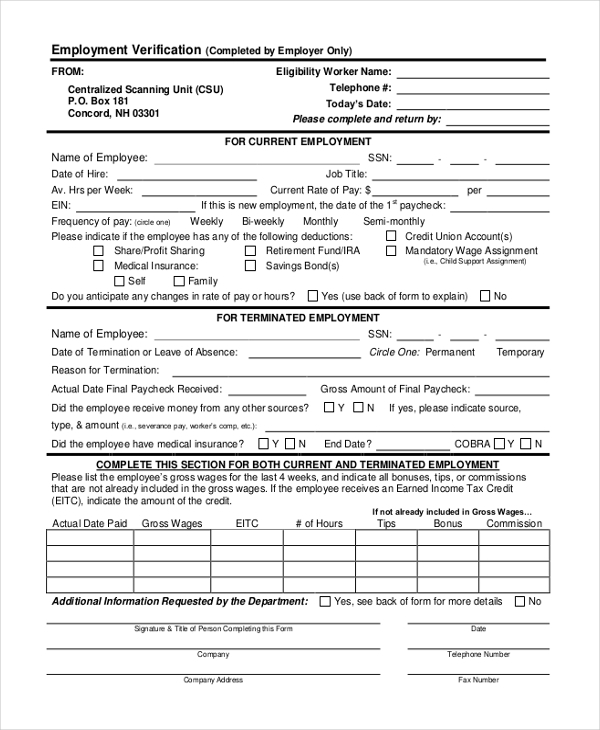 In order to file data about a subject of current employment or terminated employment, an employer is supposed to furnish details in an employer verification form to establish the employment status of the employee named in the form. 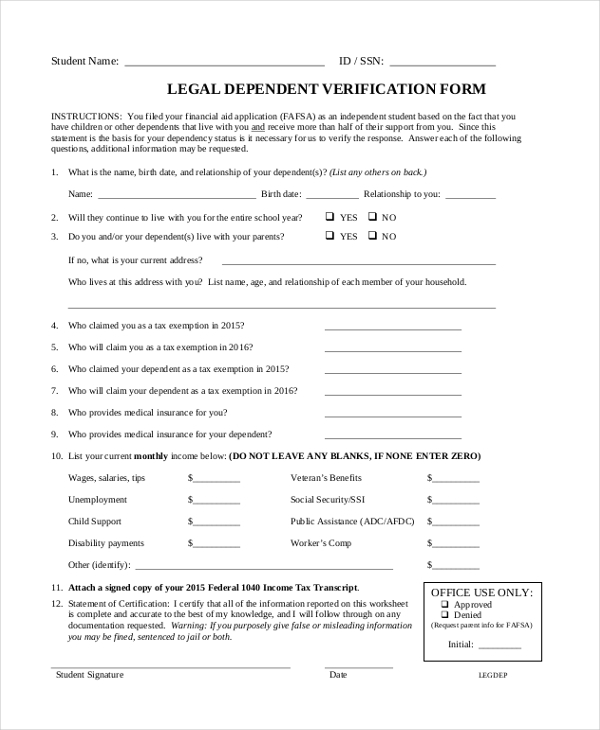 Verification forms are essentially used to authenticate data prior to determining whether or not an applicant is eligible for a certain program, aid or service. While the use of verification forms is the same almost everywhere, the fields specified in the form may not be the same. Depending on the purpose of verification, the fields are set. 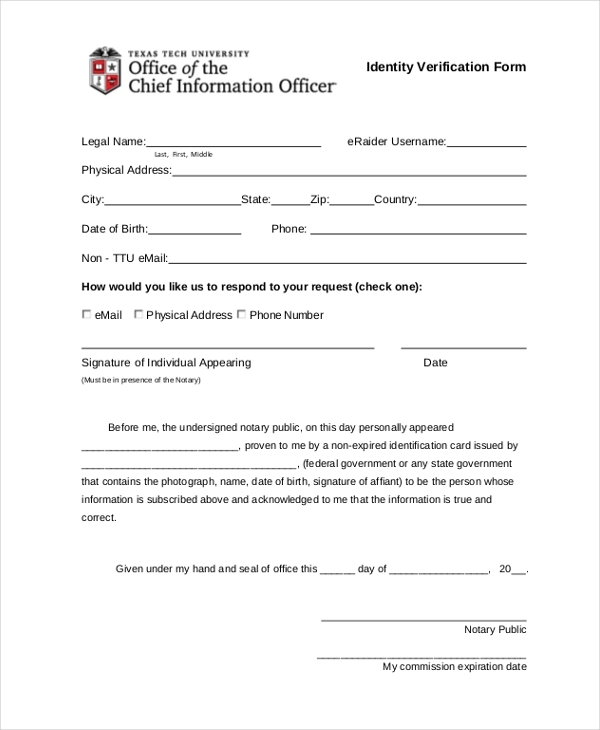 Verification forms are important mainly because they establish accuracy and authenticity of information and details provided by applicants and users that make use of these forms for a variety of tasks and services. Most matters – legal, academic, medical, etc – are tricky and delicate. Without proper verification, this kind of services cannot be provided or delivered to concerned authorities. Hence the presence of verification forms proves itself to be important. The main benefit of verification forms is that they help in containing forgery of information. Verification is a process, based on details. 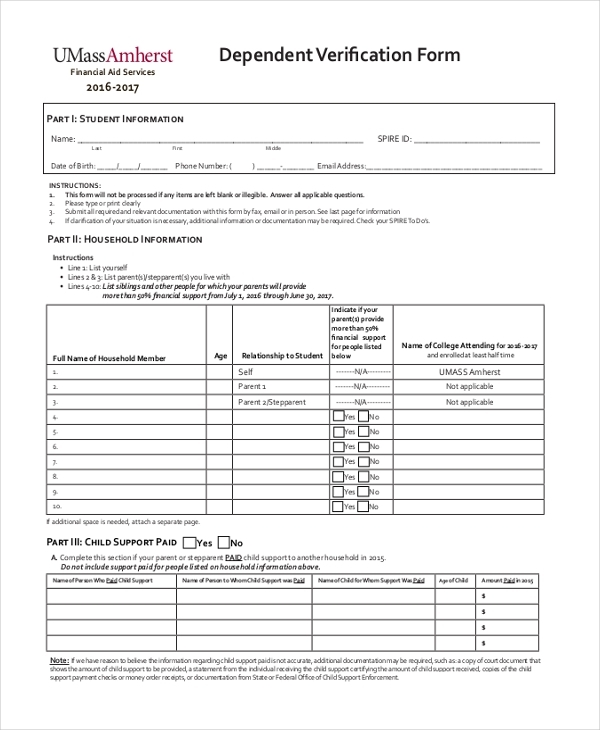 If the information provided in the other document conflicts with the matter given in the verification form, it can throw the entire exercise into a loop. In order to save the hassle, companies and authorities deem verification forms to be their best bet. Verification forms are necessary for furnishing and ensuring that the information given is true and accurate. Well-filled and accurate verification forms help in delivering services faster, better and smoother. Many institutions use verification forms and that’s proof enough of how good, useful and important they are!